On September 13, 1862, Confederate cavalry under command of Colonel Thomas Munford (under General J.E.B. Stuart) occupied Burkittsville. On Sunday, September 14, the forces of the Union and Confederate armies engaged in the Battle of Crampton's Gap, a bloody prelude to the Battle of Antietam. The Reformed and Lutheran churches and adjacent schoolhouse were used as hospitals for the more than 300 wounded of both sides. These buildings still stand today. Routinely characterized as the trigger to Antietam, victory at Crampton's Gap embodied Union Gen. George B. McClellan's strategic reaction to his acquiring the legendary “Lost Order” at Frederick which disclosed Confederate Gen. Robert E. Lee's campaign movements. It was McClellan's intention to “cut the enemy in two and beat him in detail”. After seizing Crampton's Gap Gen. William B. Franklin failed to relieve the besieged Union garrison at Harpers Ferry, and more importantly to prevent Confederate generals James Longstreet and “Stonewall” Jackson from reuniting at Sharpsburg. There Lee hastily stood his ground in the mammoth battle of Antietam, the war's bloodiest day. President Abraham Lincoln then used the marginal Union victory at Antietam as a springboard to his Emancipation Proclamation which changed war aims. Without the fall of Crampton's Gap there would have been no Antietam. 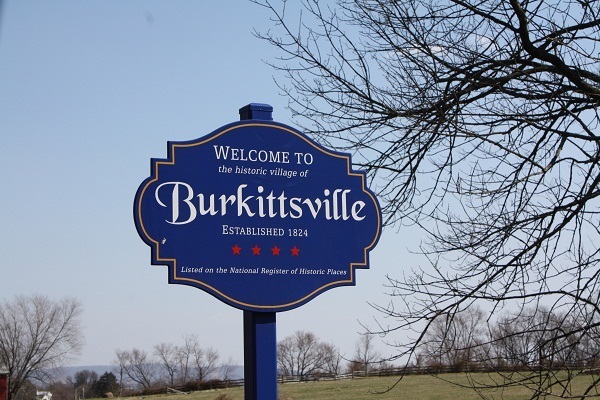 Nearly all of Burkittsville is a historic district, listed on the National Register of Historic Places on November 20, 1975. The 300 acres district includes about 70 contributing structures. The Burkittsville Historic District is itself part of the larger Crampton's Gap Historic District, which comprises the southern portion of the lands involved in the Battle of South Mountain, extending from the western side of Crampton's Gap, over South Mountain and about a mile to the east of Burkittsville.